Zeroes, the anti-hero fantasy about a bunch of teenagers with un-super powers hit the world by storm in 2015. It subverted the idea of what a super power could be and how such a skill can affect those you care most about , even affect the world. Then came the long wait for book two. Swarm changes everything. It subverts what was already subverted in Zeroes by taking each person's un-power and turning it inside out. What happens when Crash, who can destroy an entire city building's electrical system, tries to fix what she breaks? What if Mob didn't ride the euphoric wave of a nightclub crowd? Could she alter the emotions of hundreds, perhaps thousands? How about Scam? He's been forcing people to do what he wants with The Voice for years. Is there an irretrievable dark side to his manipulative skill? 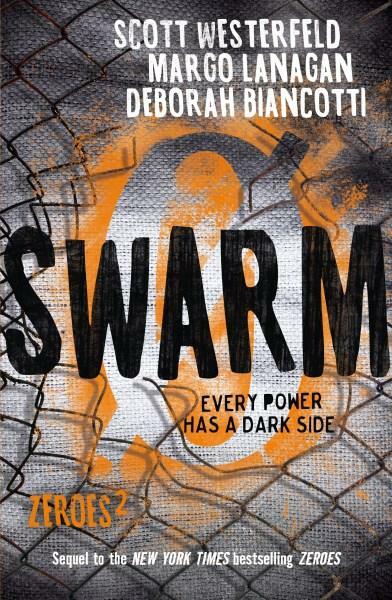 Swarm ups the ante, taking the ideas of crowd mentality, mind control and good versus evil to a whole new level. Apart from the appearance of new Zeroes with unexpected powers, there's cold-blooded murder and the terrifying aftermath. Set aside the hours you need for almost 400 pages. You won't want to put Zeroes down.